Is Your SLT a PLC? I recall doing a workshop called Leading with Teams for school heads from international schools. About 90 minutes into the session one of the participants called out, “Oh no, my leadership team is not a team.” After a good round of tension relieving laughter, he shared with the group that he wanted his leaders to be building teams in their schools and departments but realized he had overlooked building them into a team. Recently I was working with a school leadership team (SLT) examining the importance of teacher collaboration. We were exploring if collaboration was a “nice” or a “necessary” element in the success of their school. As the topic exploration continued, members realized that they were not functioning collaboratively as a school leadership team. They were more a franchise meeting than a team when they met. Individual program agendas more frequently trumped attention over school wide success. If teachers are being asked to function as a professional learning community, does it not seem appropriate for the school leadership team to be modeling those PLC actions? If members of the SLT are often serving a facilitators or leaders in PLCs throughout the school, wouldn’t it make sense that they learn PLC behaviors as a member of the SLT? What does it look like if we apply the three big ideas of PLC (Dufour) [earlier blog] to an SLT agenda? Can we identify the times that the SLT is a PLC? Big idea: A PLC is focused on results and results should be student learning achievement. 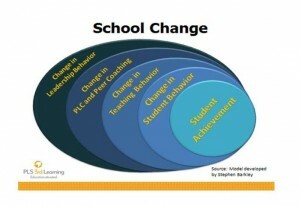 In the case of the SLT we might define the result as change in teacher learning (behavior) which we believe is a precursor to the desired student learning. I frequently point out to teachers that the strategy being implemented is NOT the result. We aren’t a successful PLC because we pulled off the science fair or a great read-a- thon. While we celebrate the successful event we are studying student work/outcomes to see if the desired learning occurred. Has student interest in science studies and exploration increased? That was our goal, not the fair. I think this is a major checkpoint for SLTs. When are we checking off that the strategies in the school improvement plan have been carried out (all the teachers completed the PD training) versus a substantial change has occurred in what students are experiencing in instruction? 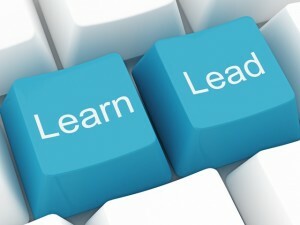 Big idea: In PLC’s there is a greater focus on learning than on teaching. More of the discussions are around looking at student learning (work/data) and deciding what will students need to do or experience to gain the desired learning. Student names are common and important in PLC settings. So should the SLT be looking at teacher work, data, and evidence of teacher learning? Using the backwards planning process, what changes need to be occurring in teacher practice for student learning goals to be met? What evidence do we have that teachers are learning and changing? Big idea: PLCs are collaborative. Teachers are working as a team to achieve desired student outcomes. This means there is shared responsibility and accountability for our students’ success. The whole math PLC is focused on the learning of the students who are retaking Algebra not just the teacher teaching that section. Five second grade teachers are focused on the success of 100 second grade students in their PLC. So should all the members of an SLT be responsible and accountable for all the teachers in the school? Does the Science Department Head feel accountable for the two Social Studies teachers who are not implementing the writing across the curriculum strategy in the improvement plan? Do the members of the SLT model the collaboration you are seeking among staff? Is Your SLT a PLC? Do you want it to be?